De tous les “petits” États d’Amérique du sud, le Paraguay est l’un des rares à jouir d’une véritable tradition militaire. Paraguay gained its independence in 1811. Surprisingly, its war of independence was fought not against Spain, but against Argentina, which wanted to annex the United Provinces of Rio de la Plata. A Paraguayan militia of 3000 men defeated the well-equipped, but less numerous, Argentine army at the two decisive battles of Paraguarí and Tacuari in January and March 1811. No helmets were worn by the troops of either army. The following decades would present the Army of Asuncion with several opportunities to gain rich military experience. 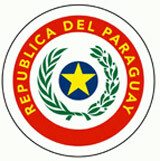 During the Guerra Grande (1864-1870) Paraguay fought a coalition of Argentina, Brazil, and Uruguay. 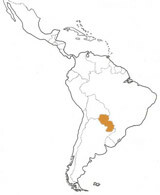 Then during the Chaco war (1928-1935) Paraguay was pitted against Bolivia. 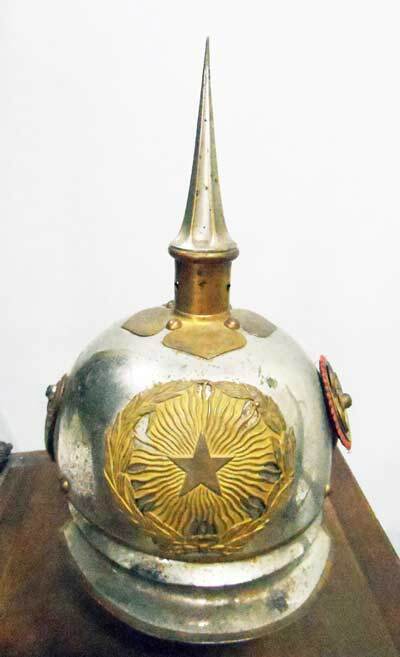 Again no helmets appeared on the field of battle during these wars with the exception of a helmet first seen in 1864 and worn by the Paraguayan cavalry unit known as the Acá-Carayá. The shell is painted with the national colors of red, white and blue, and a black crest running from front to back was originally made from the pelt of monkeys. This helmet remained in service until the beginning years of the twentieth century. 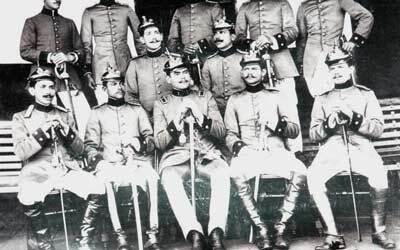 Despite this history it was not until 1905 that a military school, staffed by graduates of the Chilean Military Academy, was created in Asuncion. At the same time, the officers of the Army began wearing the imported M95 German Pickelhaube. 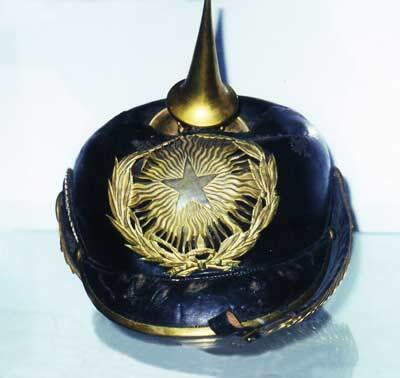 These black leather helmets sported a copper front emblem (silver for high ranking officers) and displayed the national star on a background of sunrays. Even today these helmets remain in use for ceremonial and guard duties. After the Second World War, having unsuccessfully tested a series of foreign models, the Army General Staff adopted the US M1917-A1. This model was supplied to many countries in South America at favorable conditions and in large quantities. These helmets, retaining their original painting, were decorated with a national side cockade. The signature by Paraguay of the Inter-American Treaty of Reciprocal Assistance (Rio Treaty) in 1947 led to the transfer of a great amount of military equipment from Washington, including an initial delivery of the US M1 helmet. This model quickly became standard issue throughout the Paraguayan armed forces. The helmets liners were decorated with a side cockade. Later some original decorations can be found on the helmet liners worn by officers, an example of which comes from an Australian collection. Various technical armed services decorated these helmets with unit-specific emblems. Protective and camouflage covers of various types were frequently issued with the US M1. In the 1980s the M1 model was imported from South Korea as well as a number of Orlite M76/85 models from Israel. Since the 1990s the PASGT has been gradually replacing older models through-out the Paraguayan armed forces. For tank crews the DH-132 CVC helmet is in common use in addition to a variety of older models.